Fifty years before Colin Kaepernick there was Arthur Ashe. 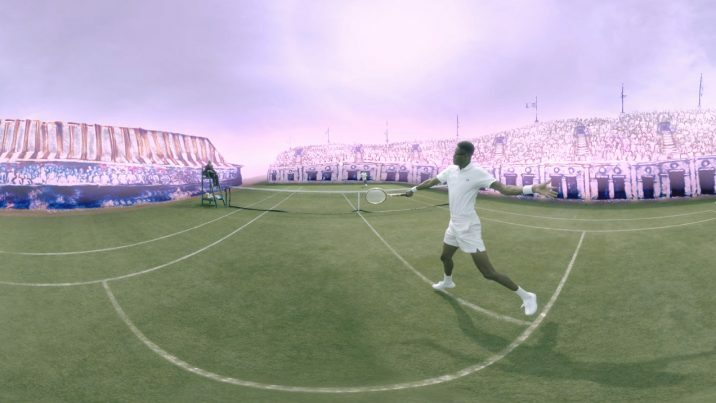 This VR experience immerses you in the tennis champion's defining moment in 1968 as he becomes the first black man to win the US Open and uses his newfound celebrity to lift his voice against injustice. Ashe ‘68 is a multi-component documentary project celebrating the life and legacy of tennis champion and civil rights activist Arthur Ashe. The project shares his story through film, a photo exhibition, an interactive installation and a VR experience–50 years after Ashe’s historic 1968 US Open championship victory. Immersive Shooter spent some time with Eve M. Cohen, director of photography for the Ashe ‘68 VR experience to go behind the scenes on the project’s production. Ashe’ 68 debuted at the 2018 U.S. Open, premiered at the 2019 Sundance Film Festival’s New Frontiers collection, and was published by Sports Illustrated. It has also been selected for Tribeca’s Cinema 360. The Ashe ‘68 VR experience combines a variety of techniques to tell Ashe’s story, including sand animation, archival material and 360 video recreations. Can you talk about how you approached your portion, the 360 video recreations? There are four live action scenes: the aerial shot, walking down the hallway, the locker room and the game-winning point. The scene that dictated what camera setupA camera position for a given scene. You might shoot more than one shot from a single set-up (wide shot and close-up). I was going to shoot on was the match point recreation of Ashe winning the U.S. Open. I knew the directing team at CRSVR, Brad Lichtenstein and Jeff Fitzsimmons, wanted to have flexibility with motion and speed control for that scene, so I wanted to shoot it at 120 fps. I also knew that the sand art illustrations would surround the field, so I needed to deliver the video at a high enough resolutionThe number of pixels in an image, typically presented as a ratio of the total pixels on x axis to the total pixels on th... More for the VFX team to do that. Since it was a recreation, the real tennis match dictated to us exactly how it would play out and I needed to strategically position the camera inside the court so the viewer would be immersed in the match without the ball crossing any stitch lins. I knew trying to match where the ball would cross the stitch would be impossible! Eve used the Canon C700 to shoot at 120 fps at high resolutions. I also knew I wanted to film nodally on a traditional cinema camera so I could have as much creative control as possible. And, I had to let go of the idea of stereoscopicVideo shot with two parallel cameras (or in the case of 360° video, multiple pairs of parallel cameras) Commonly referr... More delivery because the complications of doing that would be larger than the scope of our project would allow. That’s why I decided on the Canon C700. It allowed us to use a 250-degree field of viewThe angle of space viewable from a given lens position. lens and shoot the full sensor without cropping in at 120FPS. The Canon C700 also has an external codex recorder proprietary to that camera that allows you to shoot 120 fps at 4K or 4.5K, which is not common in a lot of cameras. This was the only solution that met the creative and technical requirements of this project. What were some of the most significant challenges you had to overcome, shooting those scenes? 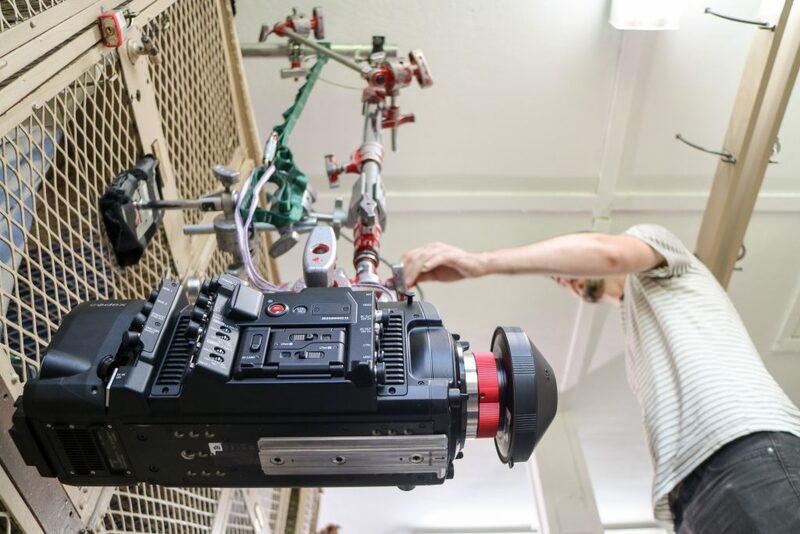 Two of the four scenes are moving–the aerial shot over the courts and the rover shot moving down the hallway. I knew filming nodally with motion was more than we were able to takeIndividual instance of a shot; a take = each time the camera is started and stopped. on for post and technical capabilities, so I used a unibody Z Cam S1 Pro. At the time I shot this, in 2017, that camera’s resolutionThe number of pixels in an image, typically presented as a ratio of the total pixels on x axis to the total pixels on th... More was high enough to go alongside the other footage without being too jarring of a quality difference. Ashe ’68 employed motion shots using both a drone (for the shot above) and a rover for the shot moving down the hallway. With any kind of motion, you introduce a new set of challenges. I’m glad we factored in a lot of rehearsal time on that day. We had to do a lot of practice tries to make sure actors are in the right places. With six supporting actors, there was a lot of theatrical coordination. In the end, we only needed to get it right once and I think we nailed it, but it took a number of tries to get that shot. What kind of pre-visualization did you do ahead of time? I don’t do much pre-vis inside a headset. Most of it is storyboards, concept boards and imagery. I also did two scouting trips before I filmed anything. Those are essential to figure out the sun direction at different times of day, which is especially important when you’re doing aerial 360. If you can’t scout, photographs are helpful–but do everything you can to make a scouting trip happen. Do you have any production tips you can share with our readers? The distance you see when monitoring what you’re shooting on an iPad is not the distance you will see in a headset. Every time you can put on a headset to check, even if you shoot just one frame, is important. You need to know the difference between 3 feet in person versus on an iPad versus in a headset. This was key in getting our distances from the actors right. The producing team, CRSVR (Creative Reality Solutions VR), in Milwaukee, found me from another project I’d worked on. They reached out, knowing this was a bigger project and that they’d need someone specifically dedicated to the cinematography side of VR. I knew within the first few phone calls that it would be technically unlike anything I’d ever done and unlike anything anyone else had done because of the style they wanted and the technical requirements necessitated by the creative. I liked the idea of tackling something that had never been created before. I’m pretty picky selective with the projects I work on. If someone calls me and says ‘We have a Z Cam and we want you to film this or that, and you’re the director, producer, audio mixer etc.’ that’s not for me. I want to be hired for my skills as a cinematographer. One of the first questions I ask is why the story necessitates being immersed inside the space. What about the story requires immersion? I think it’s important to be able to answer that question because it will help you solve a lot of production problems. For example, I did a few VR films for Nation of Artists collaboration with Qualcomm called “Power of Nine” alongside short form documentaries in three countries around the world. We made the decision to do VR because we wanted to put the viewer inside those spaces. We didn’t want them to feel or be aware of the space outside of what we were showing them. We wanted them to feel confined inside a hut in India, for example. Knowing that helped answer where to put the camera and at what height. The stories I like to say yes to lately are ones that offer technical challenges, have multimedia elements, or are part of a larger installation. I’m waiting for someone to come up with a better way for the majority of people to watch VR than as a 360 video on YouTube. The end goal should be some kind of collective immersive viewing experience, not something seen in a 16×9 frame. The Ashe ‘68 VR experience is part of a much larger project. What do you think the VR piece brings to the table of the overall Ashe ‘68 project that no other medium brings? The way it was set up at the U.S. Open last year–exactly 50 years since Ashe won the open–included three or four sections. Walking through that space, with large scale photographs, remnants and article clippings from 1968, the viewer is already immersed in that space. Putting on the headset to watch the VR film takes it to another level of immersion. In a headset, you’re as close to isolation as possible. You’re fully immersed. The immersive film experience inside an art installation adds to the interaction between the viewer and the subject. That’s the ultimate goal, to have VR as part of something larger. It’s really hard for VR to find a home, so to live as part of something else gives the VR piece a space to exist. I think if you treat VR as part of an art installation, you’ll find the medium fits really well in that world. Do you have any predictions or insight about the state of the industry? I’ve seen a huge increase in people on the lower end of VR filming VR180, and it makes me want to redefine what VR means because, to me, that’s stepping away from VR. Even monoscopic 360 isn’t VR! It really all depends on how you personally define virtual reality. I’m also interested in seeing more VR as part of immersive art installations. The more immersive we can make these experiences, the better. I recently returned from collaborating with Director Megan Sullivan and VR DP Jenn Duong on a wonderful VR180 project that Google produced with UN Women. This was the first non-streaming VR180 shoot I had been part of and premiered at the UN in NYC this past Internationals Women’s Day (March 8). It’s a series about four women’s rights activists from around the world who have had the courage to question the status quo and make changes in their communities.